Avail from us wide range of Lino Bag which are durable and water resistant. These bags are ideal for packing products that come in small granules. 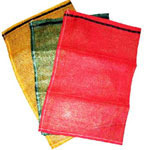 To ensure no leakage of the packed material, these bags are provided with extra liner. High in strength, these bags can be customized as per the exact requirements of our clients. We, Saijee Impex, are a reputed exporter, trader and importer of Biscuits, Confectionery, Household & Industrial Products, working in the domain since from the year 2002. In addition to this, we offer range of products like PP Bag, Jumbo Bag, Galvanized Sheets, Note Book, Spices, Food Products, etc. Our range holds great features in terms of quality & reliability. Apart from these products, we also supply turnkey projects like, Biscuits Plant, Bakery Plant, Agriculture Equipments, construction machinery, etc. as per clients requirement. By implying innovative business operations methods, we export our ranges in the wider arena of world. The products we offer is prepared by the trusted vendors of domain that hold immense expertise in making quality goods. We lay more emphasis in providing qualitative assortment of products; hence check every provided facility on strict quality measures. The quality conscious and client-oriented approach adopted by us has helped us in getting repeated orders from our clients based across East/Middle Africa, North Africa, South/West Africa and Middle East. With a decade long experience, we have been catering to the client’s requirements in appropriate manner that helps us to attain the trust of our clients. Our increasing popularity in the global markets gives us a reason to deliver only high quality products that sustains supreme features & quality. The provided range fulfill the variegated requirements of the clients belongs to confectionery & bakery industry. Matching with all the packaging competencies we have become the world-class provider of innovative household products. Our vendors assure us that the provided products are in complete sync with the latest market trends & industrial guidelines, which means there is no chance for errors in them.